We have all seen the expensive products on the shelves touted as super foods – with ‘super’ prices that take your breath away – and which are not readily available unless you live in an Ecuadorian jungle. I have serious doubts about whether these are superfoods, but I do know that one superfood is available to all of us – albeit at a rising price these days – and that’s real butter. And it’s worth every cent if you get a good grass-fed butter. Why? Let’s look at what it offers. Butter has an anti-carcinogen present called butyric acid in it, around 4% of butter is made up of this short chain fatty acid which inhibits breast tumours and helps protect us from infections, while soothing and healing the digestive tract. It contains the highest concentration of conjugated linoleic acid (CLA), especially if made from cows fed on grass! CLA not only helps weight loss, it inhibits cancer (think of that…). It has also been found to inhibit in particular, breast cancer. Don’t worry – it will NOT make you fat and it’s a healthy fat. It plays a key role in satiation and nutrition of the body. 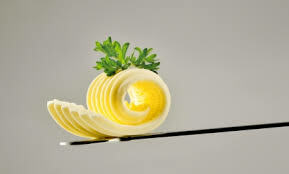 The fatty acids in butter stimulate the release of bile which allows for absorption of vitamins and while eliminating toxins and hormones from the body. Butter slows the absorption of sugar into the bloodstream. Carbs should always be paired with a healthy fat like butter to improve blood sugar levels (best not to eat too many carbs of course, just saying). Butter makes you feel fuller longer and helps prevent sugar cravings. It has the “X” factor! Dr Weston A Price found butter to be incredibly therapeutic in treating illness during the early 20th century, and he called the active ingredient which was so helpful in butter, Activator X. Now we know this is actually Vitamin K2, a powerful nutrient which strengthens bones and protects your heart. Feedlot cows have virtually no Vitamin K2 in their milk, it has to come from cows fed on grass. Hence farm or organic butter from grass-fed cows is so much better for you. Butter is also full of fat-soluble vitamins – A, D, E and K2. These are synergistic and are all vital for your good health. Butter is the perfect ‘carrier’ for these vitamins too as they require fat to be absorbed by the body. For example, the body can’t (in spite of what we have been told) convert carotenoids to any degree from plant sources into vitamin A – therefore eating butter provides you with the retinol you so badly need in usable form. If you have a thyroid disorder or are on a low-fat diet, you may be vitamin A deficient – butter is a wonderful way to get much-needed fat soluble vitamins. It won’t raise your cholesterol, don’t worry – and anyway, there’s nothing wrong with cholesterol! It’s inflammation of the arteries we need to worry about, not the normal bodily production of cholesterol which is actually a protective antioxidant for the body! Saturated fat is GOOD for the heart, not bad as we’ve been led to believe! You will live much longer with high cholesterol than low cholesterol – it’s a fact. Toss out that plastic margarine and treat your body to some delicious butter, you’ll be so glad you did. It’s a real food, and is freely available unlike some of the other so-called ‘super foods’!